The Chipper Clipper: Scrubbing Bubbles Extend a clean $.99 at Walgreen's! 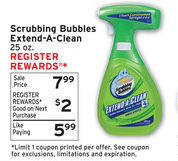 Scrubbing Bubbles Extend a clean $.99 at Walgreen's! That’s like paying only 99 cents for this item or getting it for 88% off. Check out all my other great Wallgreen's Deals for this week here!